VENDING machines were first introduced in London in 1880 but it's taken until now for an application to be found that fits perfectly with our beach lifestyle. 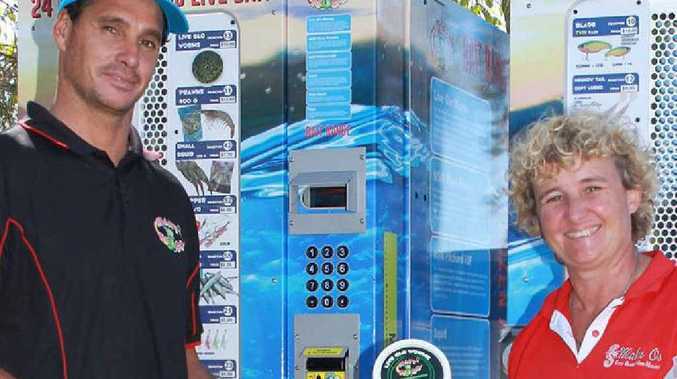 Australia's first live and frozen 24-hour bait and tackle vending machines are rolling out on the Coast. Seasoned fisherman and Bait N Go founder Sam Mouhajar said his machines would change the way people fished. "Fishing is one of the best recreational activities that people can participate in, and represents the largest recreational sporting activity in Australia,'' he said. "We wanted to create a product that's not only innovative but allows for fishing to become more accessible." After years of researching new concepts and the way people fished, he has developed a product range that includes quality live and frozen bait and tackle. The bait is sourced and harvested in Australia and packaged in 100% recyclable and reusable packaging. Mr Mouhajar said fishermen had often struggled to find accessible live bait outside normal retail trading hours and would provide a needed service last-minute and recreational fishermen particularly. The first machines are located on the river at Noosaville, where a percentage of the profits will go to Noosa Coastguard and at Kawana.